Nothing screams autumn quite like numerous mugs of Pumpkin Spice Latte, do you agree? ...Now, wait for this, this is the exciting part; if you were to chuck my two favourite things in life together (PSL, and cake... of course) you've got what could be considered an autumnal overload, and being as though cosy night in season, complete with candles flickering and pumpkin spice latte sipping is fast approaching, these indulgent delights make for the perfect comforting treat. 1.) Before you get started you'll want to pre-heat the oven to 190c/Gas 5, and set your teacup cupcake cases ready for the mixture. *Psst, if you want to be a copy cat, you'll want to dash out to Wilkinson's especially for a box of teacup cases- preferably before you pre-heat the oven mind. 2.) Are you back from Wilkinson's yet? Yes? Then you're ready to get started. In a mixing bowl, cream the butter and sugar until light and fluffy. 3.) The next task is to gradually beat in the eggs. Sift the flour and baking powder over in batches, and beat well to combine. And then finish by adding the espresso powder, cinnamon, pumpkin purée, nutmeg and ground cloves. 4.) Then carefully spoon the mixture into your prepared cases- you'll be feeling like you should maybe be on blue peter with your 'I'm so organised' ways- and bake for 25 minutes. Oh, and screw what the food tech teacher used to tell you, just go ahead and lick the bowl like you're a five year old all over again. Ahh, nostalgia. 4.) 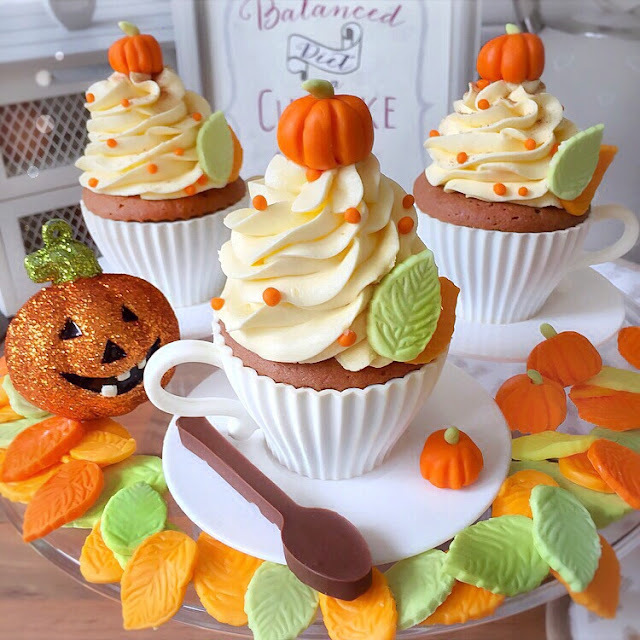 Then finish with a sprinkling of cinnamon, your handmade fondant pumpkin and a scatter of fondant leaves to give your cupcakes a real autumnal feel. 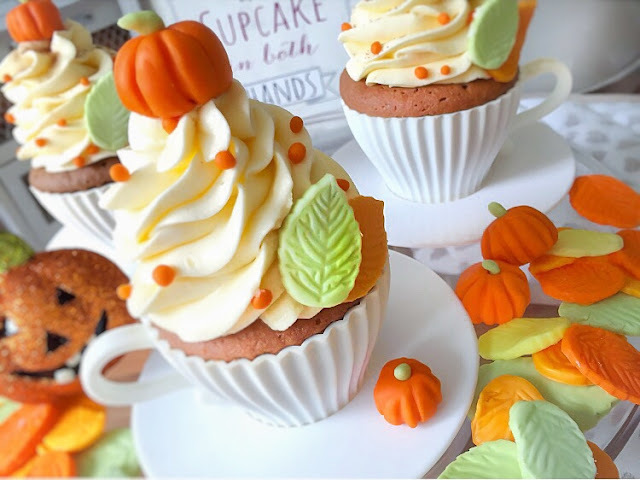 And violà, your very own pumpkin spice latte cupcakes- will you be trying them out?